Does Killing Always Lead to Death? Doing a spot of house work this morning, I noticed that my household bleach claims to "kill all known germs dead"
I've spent the morning mopping and pondering: is there any other kind of killing, perhaps one that doesn't lead to death? Visit girl with a stick's homepage! Killing does not always lead to death of the killer. It's hard to use a leaf blower to clean the skid marks off the toilet though! Well, I killed some time reading this thread. 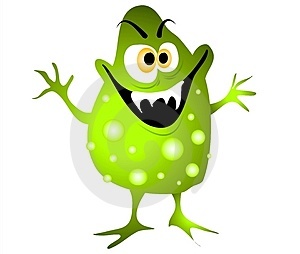 If I do not "know" any germs, will they survive? A sand blaster will do it though. Domestos used to claim that it killed 99% of household germs. I figured that the 1% that it couldn't kill were the ones you really had to worry about. Would that be in the biblical sense? Not if you're undead to start with. Probably bleach manufacturer's lawyers pointed out that it couldn't be guaranteed against vampire germs, so it was best to be quite specific as to what sort of demise was envisaged. I can remember when Domestos was strong enough to dissolve a building brick in three minutes,weak as piss it be now,they were obliged to water it down because a few feckwits drank the stuff, interestingly we are said to be related on me fathers side to the bloke who invented Domestos and Sturgene(sp) ,one has never bothered chasing this up though,I mean what would I do with a few more millions. Many years ago a chum of mine (RIP long since ) was ADC to the Governor in the Solomon Islands, where the locals - at least to the Brits - spoke pidgin. One of the gardeners at Government House asked for time off, saying "Brother belong me - him dead". Time off duly given - more or less open ended, with much sympathy. Hence surprise to see gardener happily gardening the following day. When questioned about funerals, families etc, confused gardener replies: "Brother belong me OK - him dead, not dead finish!" "kill all known germs dead"
Very Irish turn of phrase. Once had an Irish teacher who told me I was blackguard who deserved to be killed a thousand times dead. Clearly he moved onto into the marketing arena. Now I don't use bleach on my chopping board, never have, never gotten sick. So if the toilet is cleaner than that - there is no need to use bleach. So I don't. Little Jack picked up the container of disinfectant here in Spain, read "Kills 99% of al known germs" and asked his mother the obvious question: "what about the other 1% ?" She asked Mr and Mrs OFSO and I had to confess: no idea. One of the reason the generations that have followed mine are such weedy disease prone milksops is they dont get enough good honest muck and germs down their necks when their immune systems are developing,sprogs should be encouraged to get grubby make mud pies and play in the gutters like we did,builds up their resistance it do. Dad was a Sampler at ICI (Today, once equipped with Hi-Viz, safety boots and hard hat, he'd be called a Quality Assurance Inspector). He would often bring home samples for "sustained field testing". Thus, Agricultural Division fertilised our allotment and Titan Products painted the house. One day Dad brought home a vast carboy of bleach. It smelled like Domestos but was thick like glue. Mam poured some into the toilet bowl and was very satisfied with the result. "Champion!" she cried ,"Its clean enough to eat your cornflakes out of it". I declined and used my usual bowl. The one with Rupert the Bear on the rim. Inevitably, disaster struck. The carboy was shattered. In the back yard. Mam and Dad are gone now and the house is sold, yet the backyard remains forever the whitest backyard in Britain. Probably in the whole world. And no-one will ever get the fever from our old drains. In my sproghood pottering aout with me chemistry set and proper strong Domestos I managed to make some chlorine gas least I think it was chlorine gas it were green and it gave me a bad cough for a month could have been Mustard gas, tiz fortunate for humanity that I could not remember what chemicals I had added to the Domestos in the flask. Titan Products? Was that ever an ICI brand? Never heard of them. I thought they'd always called it Dulux. As to the back yards, there are also a fair few clean ones in Runcorn, where they made the CL2 and the hypo. On the original question, it is indeed a good question. If you have killed something, I think it is dead. If you are killing it, it is not necessarily dead, but the intention is there. As to a product, does it say it will kill, subject to all sorts of qualifications? There's probably a lawyer out there, right now, trying to make money out of this important question..